expecting he would let go of it. would be so embarrassed if anyone knew he gave me an old shell for a Christmas gift. and had them ready for me to take home. The only problem was they weighed between 60-70 pounds and couldn’t be checked as luggage. next time we drive to Florida, or if we get moved there anytime soon. Until I can get my Christmas gifts home here are some photos for inspiration. 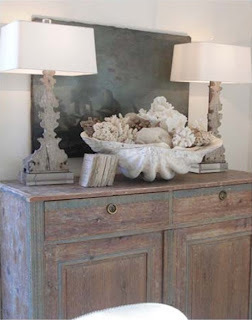 A beautiful vignette created by Tot at Time Worn Interiors. 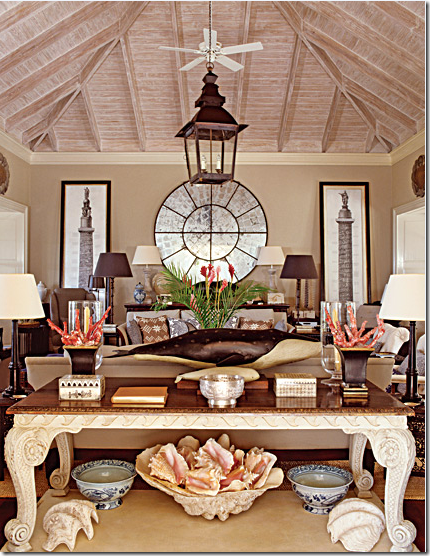 Do you like to decorate with shells? Any creative ideas appreciated. Thank you to everyone that entered the giveaway for the framed intaglios. Random.org selected #42 as the winner. in my Etsy shop. Email me if interested. YAY, I won!!!!!!!!!!!!!!! I can't believe it. Thank you!! Awesome congrats Kim! Merry Christmas Sherry and family. The shell inspiration is wonderful. You are going to have so much fun with your Christmas gift! How exciting! Gorgeous images! Love the coastal influences. Yayyyyyy Kim congratulations! Couldn't happen to a better gal. I have had several of these big shells and they sell for a fortune. It would be worth a trip to pick them up. Merry Christmas. Richard from My old Historic House. Congrats to Kim! Can't wait to see them hung in her home. Sherry,that is absolutely the sweetest story….it just made my heart melt :o) I can't wait to see the shells once you get them home…. which I hope is very,very soon!!! Sherry, you are one lucky girl…Having that shell will be so wonderful! 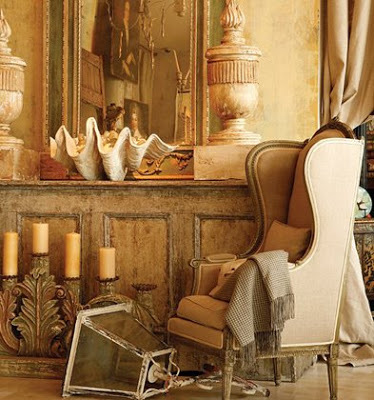 I too have been loving the look of those ginormous shells, they are perfect in vignettes, like the ones you showed us! Have a wonderful Holiday! 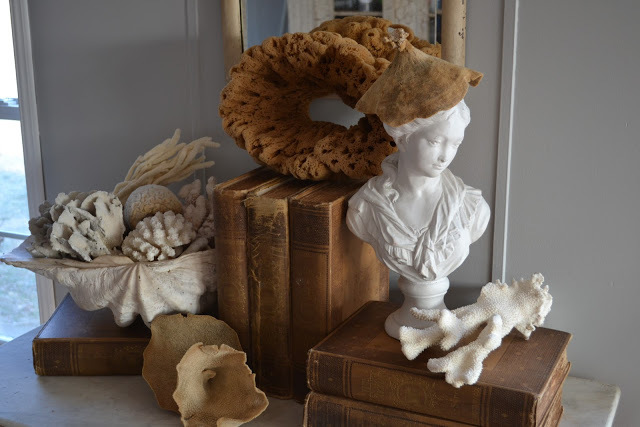 I love decorating with shells and I've seen these huge ones in shops at huge prices. I'm glad that your Dad gave you the ones you've been wanting. Congrats dear Kim, great Christmas present! You sure deserve it dear lady. Have a wonderful Christmas for you and yours. oh- I knew Kim would be thrilled and I see she is!!! Congrats to her. What eye candy in your blog today…and how wonderful that your Dad gave you those shells. I'll bet you just DREADED leaving them there, didn't you? I know I would have. Woohoo, I know that it will find a very good home with Kim! And how sweet of your Dad to give you the shells. I bet you are scheming a way to get back down there to pick them up! I am all about the seashells. Here's hoping you get your shells soon. congratulations desired end shells can now be had. *** I A*D*O*R*E your blog… just fabulous!!! "I VILL be baaaccckkk!!!!!"…. What a lovely gift Kim won!! How nice! And how nice for you that you finally got that big shell for xmas from Dad. That is so great, Sherry! If the shells are as big as some of those you've shown here, I can imagine they would be difficult to get home! Merry Christmas! Beautiful pics! Thanks for sharing. Merry Christmas! Beautiful inspiration photos! I can't wait to see yours. Merry Christmas! Cannot wait to see what you do with your dad's gifts! I can certainly understand why you would want an old clam shell! Merry Christmas, Sherry! Sherry…so hope you get that shell and soon! I bet its a stunner!! Wishing you a joyous Christmas and a healthy and happy New Year! Beautiful! Congrats to Kim! Thank you for joining me at Home Sweet Home!